This is a very unusual and rare find of a Bass. On the inside, it is totally a Guitar model Cornerless Bass with one piece Ribs each side. Outside looking from the front and back, it has Violin corners that are slightly hooked towards the middle bout. From examining the Bass while apart in restoration, the Linings were glued in place first, then cut or kerfed with the Ribs in several places before or during bending. So, the Ribs were bent 'with' the linings already glued in. To support the corners of the Top and Back, eight (8) separate scalloped blocks were glued to the 'outside' of the Ribs, each touching only one of the corners. This both protects the corners and minimizes the overweight and mass of the Bass. I have seen several old Italian basses made as Guitar form internally but with violin corners with four (4) full corner blocks glued to the outside of the Ribs touching both the Top and Back plates together. Center Bout: 14 1/2" String Length: 41"
Features: The Top as mentioned above is one/1 piece in the center with very fine grain in places but cut across the center of the tree. Post restoration, this Bass is probably in the best shape ever in its life. The sound is deep, punchy, sweet and clear. I have heard this Bass in an orchestra section from the opposite end as well as played it myself in Orchestra and Chamber concerts. It stands up just fine with larger basses beside it in the section and can easily be heard. 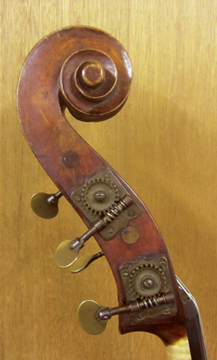 The Back of the bass is a flamed European Walnut and looks to be original to the bass from the inside and corners but was repaired at some time in its life and was over-varnished at that time. The Scroll and Ribs are matching maple as well and original. Looking over the unusual way in which this Bass was made it seems to have been made by someone with mixed training in both Lute/Guitar and Violin making, but in his early training. Some of the work is beautifully done in a traditional way and some of the work done more in the manner of making guitars and lutes. The shape of the Corners and Pegbox look elementary with the Top and Back plates un-purfled. The F-holes, Scalloped blocks, Scroll and the Arching of both the Top and Back are beautiful. I showed pictures of the Bass to an Italian Bass dealer and he said it looks like it's from Bologna. I started looking at all of the makers from the estimated period around the year 1800 +/- that made both Violins and Guitars. The only name I could find to match was Luigi Marconcini who made Violins, Lutes and Double Basses and is listed as a pupil of Omobono Stradivari (1679-1742). Some of his Basses are labeled Luigi Marconi, a name found only in Double Basses and believed to be Marconcini. Luigi started out in Bologna and later moved to Ferrara where his son Giuseppe also made Basses and is reported to be a pupil of Storioni. After looking at a few Basses by either his son Giuseppe Marconcini including one Guitar model Bass or attributed to the Marconcini family or school, I have to attribute this Bass in that direction. The name "Marconcini' used here is only to put a basic origin to the Bass and not an attribution of pedigree. 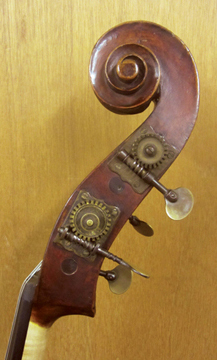 Personally, I would like to know who made this very unusual, handsome and fine sounding Double Bass. I welcome any comments the readers here may have, Ken Smith. Note: Fully restored by Robert McIntosh NY, 2009/2011. Chromatic C-Extension by Arnold Schnitzer. 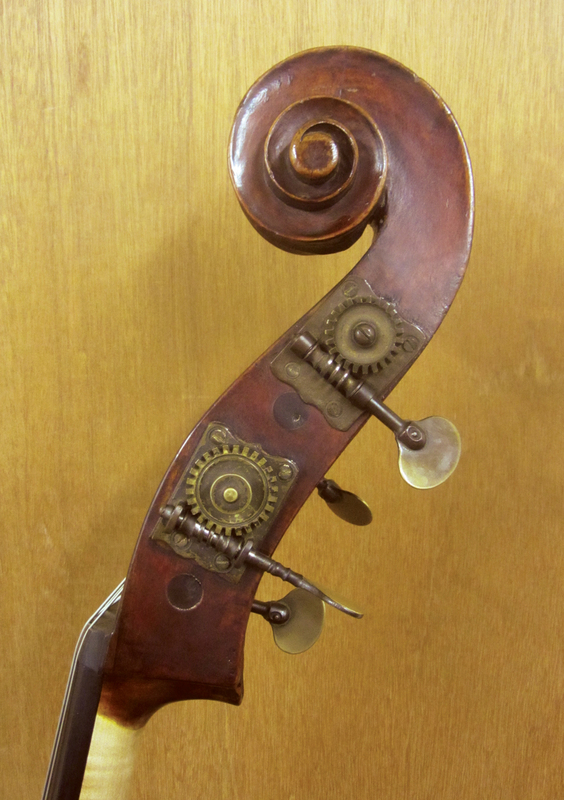 A beautiful 4-String Italian Scroll with a neatly carved individual style Button. These old German style Gears are not the originals as larger plugs from earlier Hat Peg shafts with similar quarter plates are visible under the current Gears. The G-string Gear was replaced as well at some point being the 3rd gear that string has had. 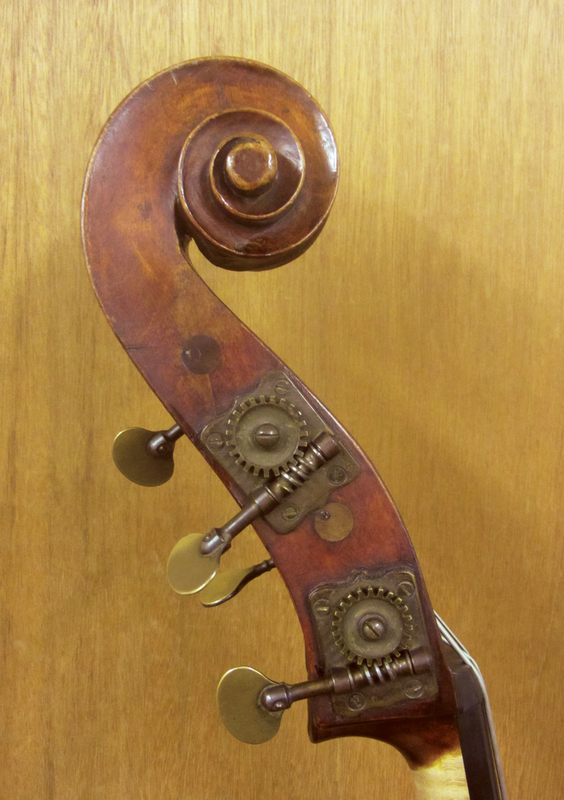 This Bass now has antiqued Rubner gears with a custom Ebony C-Extension by Arnold Schnitzer. Pics coming! Copyright © 1998-2018 Ken Smith Basses, LTD.